In November 2011 a number of experiments was carried out to determine wood flour production potential in aerodynamic Dispergator. The decision of experiment was made considering there is no efficient equipment on market, which allows to get wood flour (particle size less than 0.17 mm) and low and of good theoretical precondition for its production in aerodynamic Dispergator. ”In fact, technological process of wood flour production has certain difficulties with input material drying and consequently with considerable energy intensity. 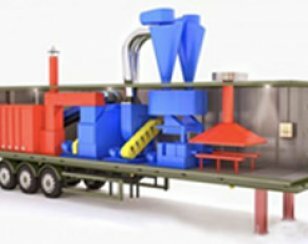 Efficiency of fine grinding materials, similar to wood flour, production in aerodynamic Dispergator is based on simultaneous combination of technological operations of drying, grinding and separation device active area. Particles with given characteristics of dispersion and humidity are separated from device active area, that allows to get homogeneous fractional composition and avoid inefficient energy consumption (i.e. there is no regrinding and overheating)”, - noted Rashid Khakimov, research manager of “Research and Production Company “Parmatech” Ltd. Under the Great Soviet Encyclopedia”Wood flour is a fine friable product, which is gotten by dry mechanical grinding of wood materials. Particle dispersion of wood flour is defined by screen fractionation regarding “State Standard 16362-86 Wood flour. Test method” and fluctuates from 120 to 1250 (number of wood flour corresponds to hole size of separating sieve, micrometers). Wood flour humidity should exceed 8%.